Whether you’re a freelancer or an employee, keeping track of your projects is probably one of the hardest (and most frustrating) tasks you’ll have. Luckily there’s no shortage of project management tools out there which can help. Paymo is one of the most comprehensive, and I’ll be taking a good look at it in this article. Paymo is an online project management tool, bundling together task management, time tracking and invoicing. This is a fully-featured application, so I’ll be focusing on the parts I believe make Paymo stand out from other project management tools. You can use Paymo in several different ways. You’ll probably work mostly with its web interface, which has every feature Paymo offers. As well as the web interface, Paymo offers iOS and Android apps. These apps include the most important parts are included. You can easily change the basic details of your clients and projects and any tasks assigned to you can be managed through the app. However, the most interesting feature is the ability to track your time. 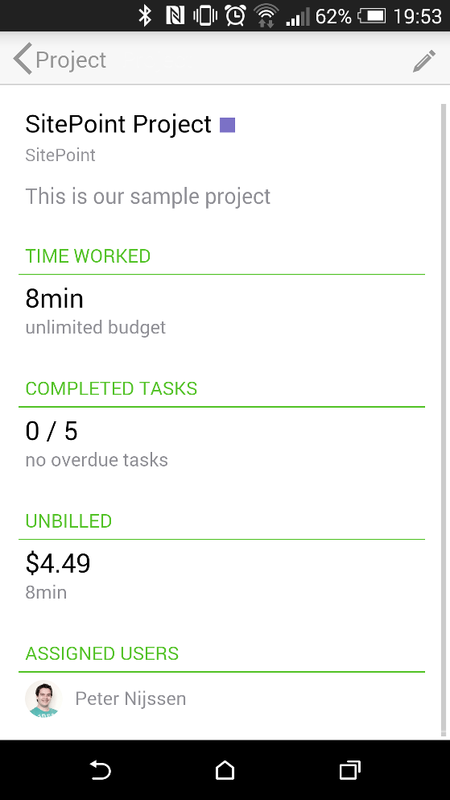 You just pick the project and click ‘start’ to begin tracking your time. This can come in quite handy when you suddenly need to track time or when you prefer to use a separate device to track it. Paymo also offers standalone applications for both OS X and Windows. Unfortunately there is no Linux support, but if you are a Linux user like me, you’re probably used to that and you can live with it. The first app they provide, is the Paymo Widget. This is a small utility program that helps with tracking time. It comes with handy features like a stopwatch, time sheet editing & idle detection. The second app is named PaymoPlus. PaymoPlus will take note of all your open applications and windows. At the end of your session, you just have to match the applications and windows with the correct project and the time will be tracked. To keep it simple, I’ll be referring to the web interface throughout this article. But be sure to check all the extra add-ons Paymo offers. Before I dive into the functionality and see what’s possible with Paymo, it’s interesting to look at the usability of the application. If you’re dealing with large applications like Paymo, it’s important the navigation is clear so you can find what you are looking for, and that the application is easy to use. 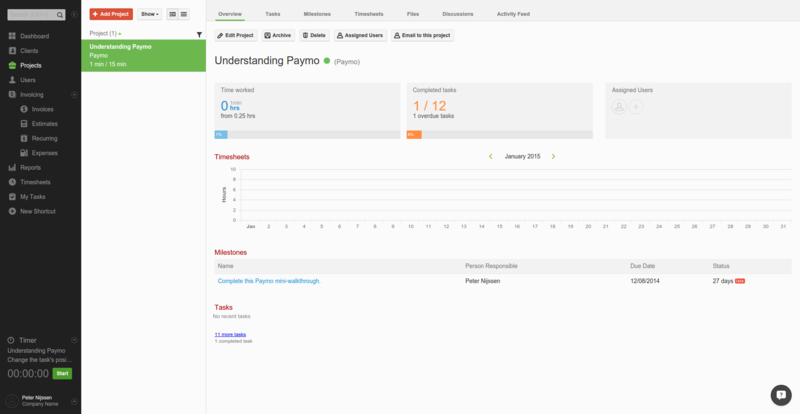 Above, you can see Paymo’s dashboard, displayed after logging in. The menu stands out very clearly and there’s a quick search bar available. The small, colored bars at the top of each graph indicate whether it’s a graph about time tracking, projects or clients. From here, every page in the app is very consistent in it’s color and styling. Time tracking is something you’ll want to do quickly and frequently, so it’s nice to see a widget at the bottom-left of the screen that allows you to quickly start the clock. More detailed pages like Clients, Projects and Users are also very clearly designed. In the projects page you navigate from the left to the right to get to a different area. Within a given project, you can use the tabs at the top to navigate. Whatever is selected — whether in the menu, a project or a single tab — always has the same green color. Naturally, one of the most important parts of the application is the part where you add and manage projects. Adding a project in Paymo is easy: just pick a name, a description and then a client. To distinguish this project from other projects, you can also assign it a particular color, and you can set whether the project is billable and how much should be billed per hour. A nice feature is the ability to define a given project as a template. This means you can configure the project to your liking, save it as a template, and then use it again and again. Imagine you’re selling a project with the same basic set-up every time. By creating a template, everything can be prepared automatically. Within a project, you can work with tasks. Imagine you’re selling licenses for a certain product. Every time a license is sold, multiple people have to perform steps to get the product up and running for the client to use. 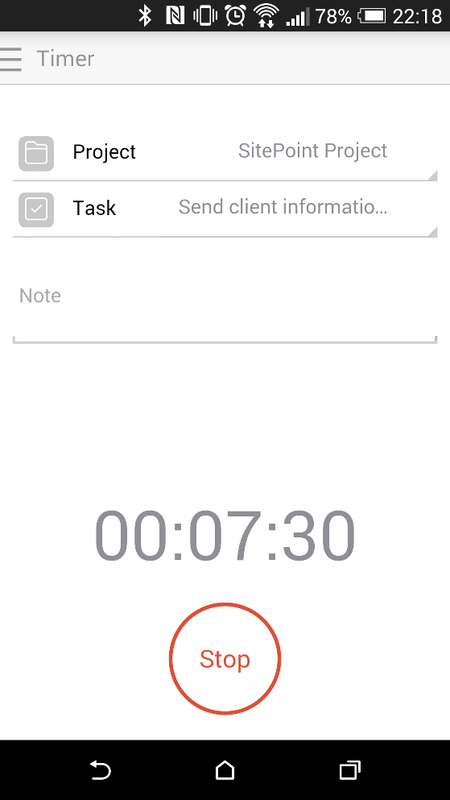 For that, Paymo allows users to create task lists. As you can imagine, a task list groups multiple tasks together. This makes it easy to divide your project into several phases, assigning tasks to every phase. The nice part is that a task is not just a single title and description field, but also supports comments and uploads for every task. This way, it’s easy to discuss tasks with your co-workers, and you can add files which are necessary or related to the task. This task sharing is at the heart of any project. As you can see in the screenshot above, there are many more menu items to choose from. Almost all these menu items are correlated with pre-defined tasks. For instance, within the Milestones tab, it’s possible to set milestones for task lists and assign a person to each who is responsible to get their task list done. This comes in handy when you want someone to manage multiple tasks and you want to set a clear due date for all tasks. 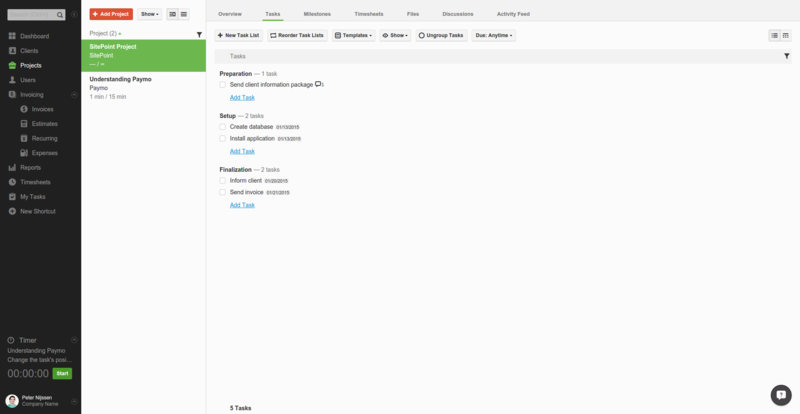 The Files and Discussion sections are also related to the earlier defined tasks. Any comment added will appear below the Discussion tab as well. However, I can also create new topics within this tab. This is a central point that lets you easily follow discussions related either to a single task or a topic. The same goes for the Files tab. If you assigned files to a certain task, they’ll appear here. You can also upload separate files in here. The neat part is that you can comment on files. If the file is related to a task, the comments will also appear within the task itself. This means everything is neatly organised and put together. Whether you comment on the tasks or on the assigned files, you’ll always see the entirety of any ongoing discussions. Next to these tabs, there’s also a Time Sheet tab. Whether you use the Paymo app or the widget at the left, any time tracked for a project will appear here. If you forget to actually activate your time tracker, you can easily add your time manually by filling in a simple form. The last tab is the Activity tab. Within this tab, you can see a global list of all actions performed within a given project. Invoicing is a very important part of project management — everyone wants to get paid for their work, right? For this Paymo offers an easy-to-use invoice module. Invoices are prepared with several global settings. Most invoices can be generated automatically, saving a lot of time. For instance, you can select a client and assign every hour of work recorded within a certain timeframe to their invoice. 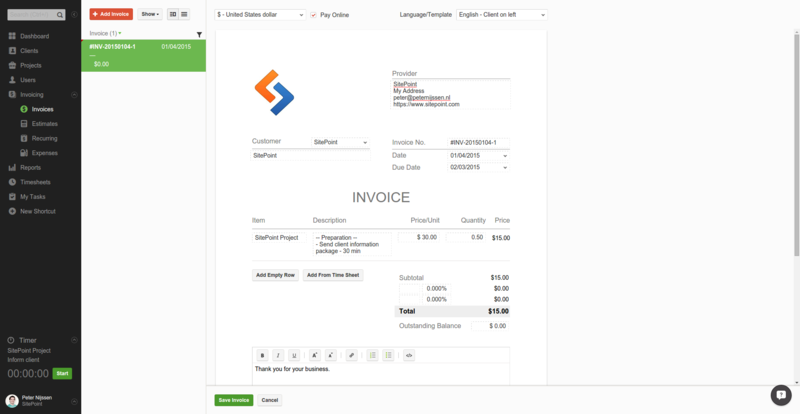 Since you can also set a price for a project, you can generate a whole invoice with a couple of clicks. The nice part is that you can still edit every single value, and you’re not stuck with the global details inserted when a project is created. For instance, you can set a higher price for a certain rule, because it has a set price. So Paymo offers a quick way to create a more generic invoice, but also let’s you handle specific cases with ease. If you take a closer look on the menu on the left, you’ll notice that invoicing contains several different parts. 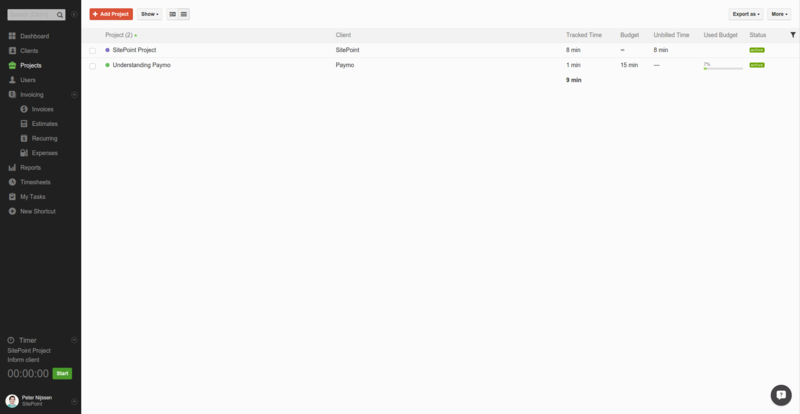 You can also create estimates and recurring invoices, for example. The interface is the same as the invoice creation interface, but with specific fields that match the actions needed. With recurring invoices, we get an interval and a start date, for example. When you’ve created your estimate and you actually want to convert it to an invoice, just open the estimate and click “Invoice”. You can change variables if you like, but basically your invoice is ready to be sent. This is an interesting feature. 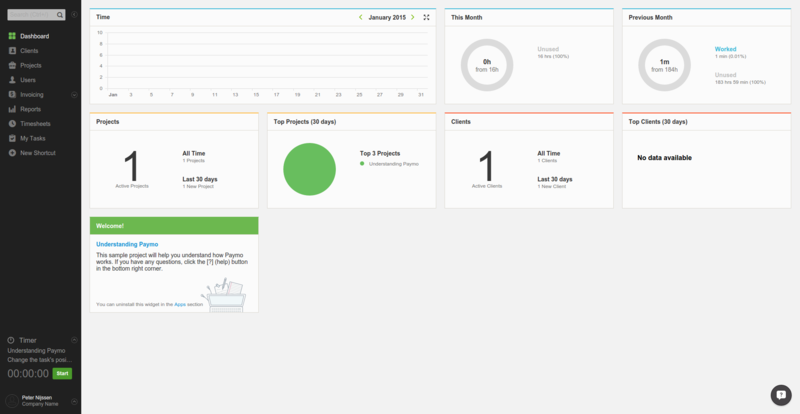 Reports give you an overview of how time has been spent within a project. You can choose whether you want to have a live or a static report. As you might expect, a static report won’t change, while a live report will be updated automatically as soon as something happens within the project. You can also do things like round up hours to 15 minutes or group times by date. This allows you to share a report with your client through a static link. Your client will love having a live report of all the hours spent so far on their project. There’s no need to share an annoying Excel spreadsheet (which you’ll need to update yourself). Just share a report with your client, which gets updated every time you clock your time, and get back to work. When I’m using an application and I can’t work easily with it, I drop it in no time. I think it’s important you can easily customize the application to your own needs and find your own way of working with it. Paymo offers a lot of possibilities in this area. One of the things I liked immediately was the fact that I could add a shortcut in the menu. If there’s a project I need daily, I can add it to the menu, allowing me to quickly access it. Another interesting part is that you can disable certain aspects of the application. You can disable certain graphs in the dashboard or completely remove invoicing from the system. If you don’t use it, just remove it. Also, the views are customizable. Until recently, I’ve kept a list of projects on the left, next to the menu. You can also choose to show an actual list of projects within a table, which shows additional columns with more information. The only interesting thing I noted here was that as soon as I switched to this view, additional functionality appeared. Suddenly I can export a project to a CSV file. I was unable to find this functionality within the project or on the default list itself. I believe only the export button appears, so you’re not missing any great functionality, so it’s not a real issue to me. Paymo’s best feature is its high level of consistency and integration. Comment on a file or a task — if they belong to each other, so do the comments. 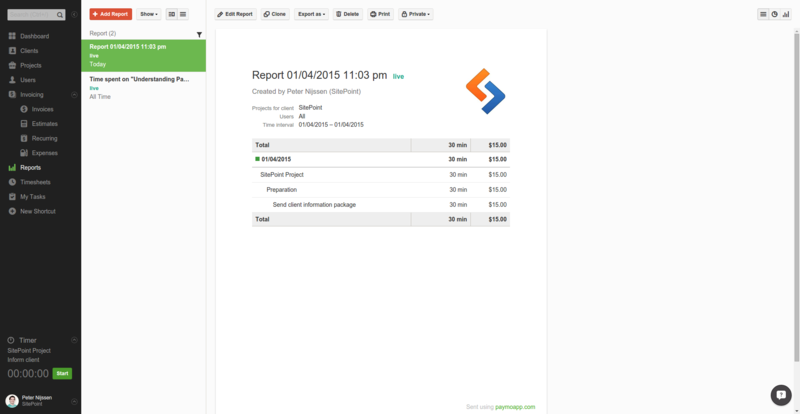 If you create an invoice, you can easily retrieve data from other parts of the app. When you configure everything correctly, there’s not much more to do than just creating a new invoice and clicking send. Another interesting part of the app is its customizability. You can add shortcuts to your most-used projects, the different views that are available, and all the existing apps you can hook into or remove from the application. What clients will like is the ability to share live reports with them, getting an up to date overview of how time has been spent so far.